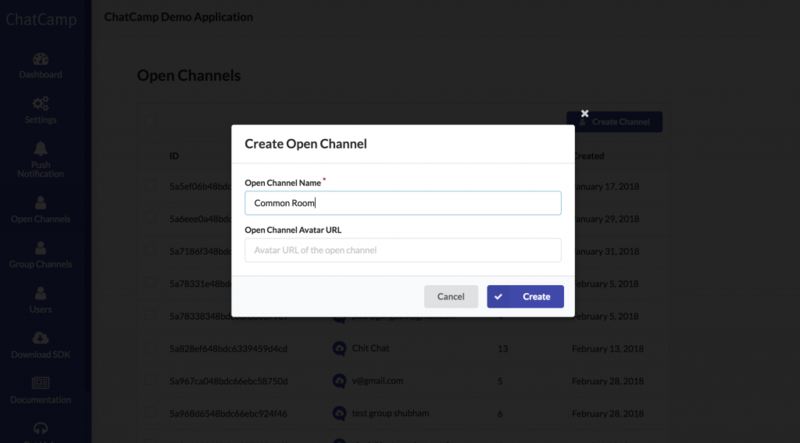 An open channel allows user to connect to the channel without any prior invitation. It is mean to be used for public conversation where any number of users can participate. We initialize ChatCamp Web SDK by creating a new instance of ChatCamp class and passing our ChatCamp application ID to it. This app ID may be retrieved from ChatCamp Dashboard. Next we create a random user ID and user display name. Finally we use connect() function for establishing chat connection and then we use updateUserDisplayName() to set the name of the user in chat. Next we need to create layout for our jQuery chat app with the help of Bootstrap framework. We will add one header at the top. It will be followed by chat room content in the center. We will also have a footer section which will have chat input section. Let’s start by adding the following HTML code inside chat-app div. So the chat app contains three sections namely header, history and message. The header section shows open channel information including name and participants. The history section shows chat messages of the open channel. The messages are received and updated in real time. Finally the footer section has input box to send the message. Now let’s get the chat history by using createPreviousMessageListQuery() function of the OpenChannel class. This will return an instance of PreviousMessageListQuery class. It contains a function called load() which we will use to fetch the chat messages of our open channel. Here we request 50 messages from the server and once the chat messages are retrieved we loop through them and add them to our jQuery chat app and finally we move scroll to the bottom. The onOpenChannelMessageReceived callback method is fired whenever a new message is added to the open channel. We register our instance of ChannelListener with the help of addChannelListener() function. Finally let’s implement the send message functionality. The sendMessage() function of OpenChannel class allows us to send text message to the open channel.